Q. I have TimePilot Vetro, and I'd like to use my own USB drive to collect data. Is that possible? A. Yes, it is—with one thing to watch out for: We recommend that you not put any other files on the USB drive except those for your Vetro system—in other words, dedicate a USB drive just to Vetro. We also sell replacement USB drives at a reasonable price. Click here for details. Q. Why should I activate my software? A. The short answer is so that it will keep working for you and make it easier for you to get the support you may need. You have 30 days to activate your software from the date that you install it. If you haven't activated the software, it will remind you each time you start it. When you activate the software, you start the 30 days of free e-mail and phone support you receive with the product. Activation notifies TimePilot that you purchased our product and helps our Support Technicians answer quickly and easily any question you might have. Q. I'm trying to activate my TimePilot software, and it's asking for my serial number. Where can I find it? Q. What's the difference between my serial number and my registration number? A. As mentioned in the previous question, your serial number is on a sticker in your manual and proves you purchased the software legally. Your registration number is issued at the time you activate the software and indicates that the software has been successfully activated. If you activate the software via the Internet, the number is automatically transmitted into your software; if you activate by phone, a Technical Support specialist will give you a number to enter into the appropriate place in your software. If you can't read the words, click this button to get two more. 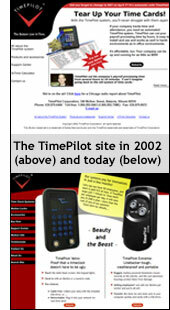 To learn more about this deal, click here, visit www.TimePilot.com/newsletter/newsletter4.htm or call us at 1-630-879-6400. © Copyright 2011, TimePilot Corp. All rights reserved.